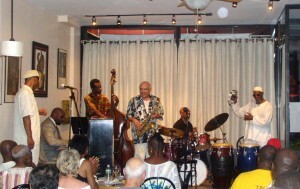 The group featuring James Spaulding on alto saxophone and flute with pianist Sharp Radway, Eric Lemon on bass, drummer George Gray and percussionist Sabor, also included TC the III as guest vocalist. 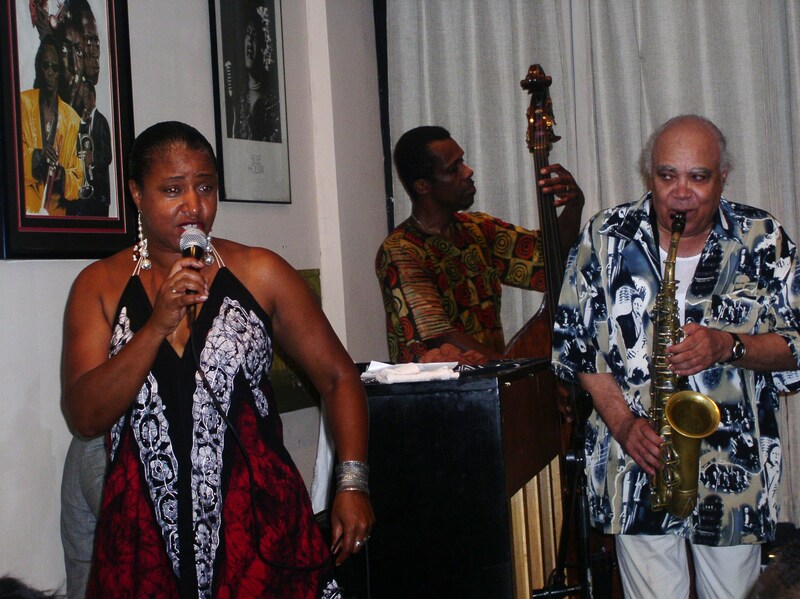 As expected (because that has been James Spaulding’s history of 13 years performing at Sistas’ Places and countless performances on recording and in other venues), the music was on such a high level that it left one with the impression that it couldn’t get any better. Mr. Spaulding’s sets, over the years, have begun with a ritual befitting the transformative music of the spirit that it is. He generally “tunes up” his audiences with a very open and free form improvisation led by each individual member of the ensemble. By the time the ritual is taken over by last improviser, in this case TC the lll, the group and the audience are opened up and in tune and both are ready to take off. It is a masterful approach that this writer has seen work successfully, every time! After the introductory proceedings, the clave rhythm (1-2-3-4,5) that Mr. Spaulding clapped out brought the audience into full participation and the band moved into playing “Oracle,” an original James Spaulding composition, with a vengeance. This concert was a celebration of James Spaulding’s 73rd arrival day (aka birthday). Throughout the two amazing sets of music Mr. Spaulding played both instruments with an incisive energy, wisdom and passion that must have inspired the other great musicians he chose for his ensemble because they also sounded amazing. Pianist Sharp Radway, who comes from Hartford, Connecticut, has an approach to the piano that demonstrates an extraordinary gift. His rendition of the classic, “You’ve Changed, ” made popular by Billie Holiday toward the end of her life, was a complete deconstruction and restructuring of the song, leaving the audience in an uproar. Eric Lemon’s steady and sound bass work has been a consistently great presence in Mr. Spaulding’s ensemble for 13 years of appearances at Sistas’ Place. George Gray’s drumming led off the Max Roach composition, “It’s Time,” with an incredible tribute, in that any drummer can dare to find something new to play on one of the master percussionist’s composition. Well, George Gray dared and did. 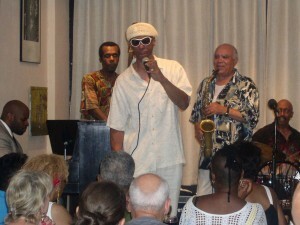 Percussionist Sabor’s careful attention to the music is demonstrated in the meticulous choices he makes given the wide array of instruments he has to choose from. He is always right on it, playing with the spirit of the music. TC the III is one powerful vocalist, and like James Spaulding, has roots with Sun Ra which has allowed him to take risks with compositions always making his presentations exciting, interesting and completely of the moment. His version of “Yardbird Suite,’ the Charlie Parker song with lyrics by Eddie Jefferson and his exchange with James Spaulding on the closing theme to the first set, sometimes known as “Flash Gordon,” often just called the “Theme,” was classic. The band was so inspiring that two of the several musicians in the audience sat in. The wonderful Vanessa Rubin gave up a very unique version of “Summertime,” and in keeping with the mood of the night, it was one of the highlights of a night of highlights. As well flugelhornist Kamal Abdul Alim offered a lovely contribution on his instrument. Other musicians present (which is a good barometer that great music is being played), included bassist Radu, trombonist Kiane Zawadi and vocalist Mari Toussaint. They were there to bear witness to the fact that great musicians like James Spaulding are like a good wine getting better with age. The performance of Jimmy Spaulding for his birthday was so sparkling, so perfect, that I had to be in the experience which was to the heart, to the mind, to the body, so nourishing that I could not write anything down. Just had to be in it. 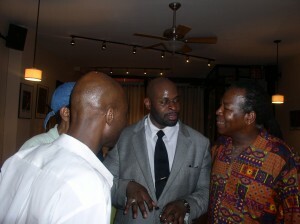 The brother, Sharp Radway was brilliant. This was testimony to the affirmation that his parents gave him in naming him, “Sharp.” He lived up to the name not only in the warm intelligence of his playing but in the wisdom of the church that he evoked. His rendition of Billie Holiday’s “You’ve Changed” , brought everyone in the house to their feet and we were indeed changed by the cadences of the church in those magical chords in the house of Sistas’ Place. His attire was also impeccably sharp. TC III has a voice and a style that would rival any singer out there today. The song made known by Leon Thomas, “The Creator has a Master Plan,” was such collaboration between him and the audience. “Peace and Happiness for every man…. woman and child.” Every musician on the bandstand seemed at the top of his or her game. George Gray and Sabor exchanged exquisite rhythms on the drums and percussion while Eric Lemon never missed a beat holding the whole thing up. James, in his element, reached us through the power of his versatility on alto sax and flute while exhorting the “power of the spoken word.” As always with a true musician, he just kept playing one gem after another. When it was finally over, as folks were lingering, James said to me, “This is one of the best birthdays I’ve had!” I responded that Viola Plummer had said, as she praised the band for their amazing gift of their performance that we were going to repeat this 73rd birthday celebration from here on in. So don’t miss it next year! So there we have it. A joyous celebration. It is possible to live without live music of the spirit like this, but not wise. This entry was posted on Saturday, July 31st, 2010 at 4:42 pm	and is filed under General. You can follow any responses to this entry through the RSS 2.0 feed. Both comments and pings are currently closed.